You may have heard it said that, in life, you only get out what you put in. It is a nice thought but, if this were strictly true, it would be completely impossible for businesses to operate! This is where ‘return on investment’ (ROI for short) comes in. ‘Return on investment’ is a simple measure of how much you might expect to get back from any particular investment. ROI will basically tell you how much you will get out, when compared to how much you put in, expressed as a percentage. To get the ROI as a percentage, you would take the answer this equation gave you and multiply it by 100. For example, if after doing the division part of the equation, you ended up with the answer 2, the ROI as a percentage would be 200%. Confused? To make things clearer, here are some examples of what various ROI percentages mean in real terms. -100% = You’ve lost all the money you put in. -50% = You’ve lost half the money you put in. 50% = You’ve got back what you put in, plus another 50% of that amount as profit. 100% = You’ve doubled your money! Now, let’s take a look at a basic business example and see how this formula would apply. Say some children wish to set up a lemonade stand on their street. They spend £5 of their pocket money on lemons, sugar and all the other ingredients that they need. They have enough to make 20 cups of lemonade. They charge 50p a cup and manage to sell them all. At the end of the day they would have £10 in their till. As we know, an ROI of 100% means they doubled their money, making lemonade look like a pretty good investment! Of course, this example ignores the cost of their labour and time, but for big businesses (and your personal finances) these things are very important. 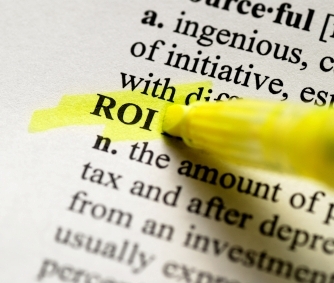 How Do Businesses use ROI? Obviously, having a high ROI relative to your competitors is vital to running a successful business. Big businesses take a great deal of care in deciding how best to spend their money and they will attempt to calculate as accurately as possible the ROI of all the money they spend, from the wages they pay employees, to the their advertising budget. In fact, businesses are so obsessed with ROI, some will even calculate the return on investment they get from spending money and time on calculating ROI itself! The reason they go to such lengths is to ensure that their money is put to the best possible use i.e. the use that will yield the biggest return on investment in the end. Sometimes this will involve doing something that at the time may seem a bit outlandish, but is justified by the eventual ROI. In our article on opportunity cost we talked at length about the ‘time value of money’ and this is a big factor in figuring out ROI. For example, when firms first splash out on TV advertising, it costs a very large sum of money. This is eventually made back, as their brand gets a bigger profile and they win more custom (assuming the advert isn’t a flop) but it takes time. Another example might be the emergence of a new technology. Businesses will scramble to snap it up, not because of what it is worth now, but because of what it might be worth in the future. The key to spending wisely is figuring out the eventual ROI of your investment, rather than merely looking at the cost. If the ROI is great (and you can be sure the projected ROI is correct), the cost is almost irrelevant (assuming available funds). Like a businesses, you to can make wise spending decisions by attempting to calculate the ROI they are likely to generate. Of course, there are big differences between the way individuals and businesses spend their money. A business only ever spends money on anything because it hopes to make more money further down the line. As cynical as it sounds, even when a businesses makes a charitable donation it will have most likely have one eye on the ROI that the positive publicity will create, not to mention the tax savings! Unlike a business, people generally buy things simply because they want them, not because they will make us better off in the future. If anything we fully expect most of our purchases to make us worse off financially. In this case, we think of the ROI simply as the pleasure we’ll get from buying whatever it is we have our eye on. That said, there are plenty of ways we can think like a business, spending money in order to make money. Just as a business has assets, so do individuals. In most cases a person’s biggest asset will be their property. It is possible to add value to assets by investing in them and there are a wide range of things you can do to increase the market value of a house, from something as simple as a quick paint job, to something as extensive as having an extension built. As these things add value, they bring a return on investment. Smart people realise that, whilst it is important to consider the cost involved when undertaking such a project, ROI is the real measure of how best to spend money. An ROI of 200% means you’ve tripled your money! Though our ‘common sense’ tells us that the £10,000 investment is the bigger, more risky investment, a look at the ROI tells us that this is not the case. The bigger the ROI the more value you get, pound for pound. So, though the double glazing seems the cheaper option of the two, you pay more dearly for every pound of value it adds to you home than you do with the loft conversion. It is, therefore, relatively speaking, a more expensive way of adding value. Obviously, you need to have dependable figures to calculate ROI in the first place, but in the examples given above these can normally be found quite easily. The other key thing to remember when calculating ROI is the time frame involved. There is no point working out how much your new energy efficient car will save you over the course of ten years if you replace it after just two!